SHANGHAI - Stocks on the Chinese mainland rose on Monday, capping the first monthly gain for the benchmark index since October. The advance came on expectation that the government's plan to build more low-income housing will boost demand for construction materials and household appliances. Sany Heavy Industry Co surged to a record high and Huaxin Cement Co climbed 2.97 percent. Gree Electric Appliances Inc and Qingdao Haier Co jumped to all-time highs. 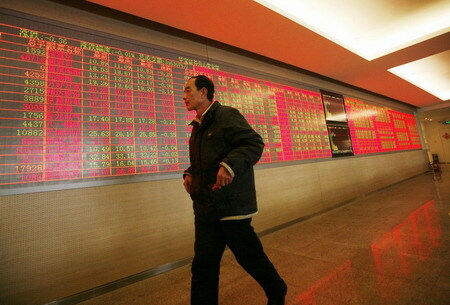 The Shanghai Composite Index rose 0.92 percent to 2905.05 at the 3 pm close. It has gained 4.1 percent this month. The CSI 300 Index added 1.31 percent to 3239.56. "Lots of companies, particularly consumer companies, will deliver steady earnings growth this year and that's very attractive, given current valuations," said Zhang Ling, general manager at Shanghai River Fund Management Co. "The economy is in fine shape." The Shanghai gauge is valued at 13.6 times estimated earnings, compared with 15.9 times at the end of last year, according to weekly data compiled by Bloomberg. It has advanced 3.45 percent this year. Sany Heavy surged 8.53 percent to 25.20 yuan ($3.83). Changsha Zoomlion Heavy Industry Science & Technology Development Co added 4.7 percent to 15.20 yuan. Guangxi Liugong Machinery Co, a maker of construction equipment, gained 4.68 percent to 15.20 yuan. Huaxin Cement gained to 40.19 yuan. Anhui Conch Cement Co added 0.96 percent to 34.61 yuan. Gansu Qilianshan Cement Group Co climbed 2.04 percent to 18.50 yuan. Cement prices may rise "significantly" in the first quarter as construction of low-income housing boosts demand for the building material, CITIC Securities Co said last week. Gree advanced 5.37 percent to 21.21 yuan. Haier climbed 6.31 percent to 30.85 yuan. GD Midea Holding Co jumped 6.59 percent to 19.90 yuan, the highest in three years. TCL Corp surged 10 percent to 4.82 yuan, its highest close since April 26. The television maker said it plans to give investors one bonus share for each share held.